Both games and business loom large in Stewart Butterfield's creative cycle. His first project was an innovative MMO called Game Neverending, which never made it past the prototype stage, but nonetheless birthed the photo-sharing site Flickr in 2004. That humble little property blew up, of course, and Butterfield suddenly became a man to watch. Flash forward to 2009. Butterfield introduced a new MMO game called Glitch. It was a hit among fanatics, but there weren't enough of them, and Glitch shut down for good last December. But just like before, Butterfield is raising a potentially powerful phoenix from the ashes of an MMO. This time, he's focusing on collaboration and communication software for business environments. It's called Slack, and it's the very software Butterfield and his team developed to help them create and run Glitch. Butterfield's company, Tiny Speck, is developing Slack to meet the needs of its own multiple-location business. Tiny Speck's principals work in three different cities, two different time zones, and two different countries. Off-the-shelf collaboration platforms just couldn't fulfill Tiny Speck's requirements for keeping everyone in touch. Just a few days ago, Tiny Speck added the word "working" to its public mission statement, signaling the intent behind its next project. A Tiny Speck employee who spoke with PCWorld says that group colloboration platforms already on the market can be frustrating. "They try to enforce a worldview as to how things should be done," said the source, who requested anonymity. So rather than than use software that might not fit their needs, the Tiny Speck crew built their own. Several external companies are already alpha-testing the tool. But in a way, the current alpha testers more like beta testers, as Tiny Speck used Slack for months before letting other companies try it out. When Flickr launched in 2004, other photo-sharing sites like Shutterfly and now-defunct Kodak Gallery were focused on selling customers paper prints of digital images. But Flickr's freemium model and easy-to-use interface quickly won the favor of photo enthusiasts. "There was a burgeoning prosumer photo community that wanted to share imagery in a way that wasn't cluttered by cat photos and general consumer content," says Chris Chute, IDC's Research Director for Worldwide Digital Imaging and SMB Transformative Technology Research Practices. "They weren't interested in printing," Chute says. "Smugmug and Flickr hit at the right time to focus on Web sharing, not print." 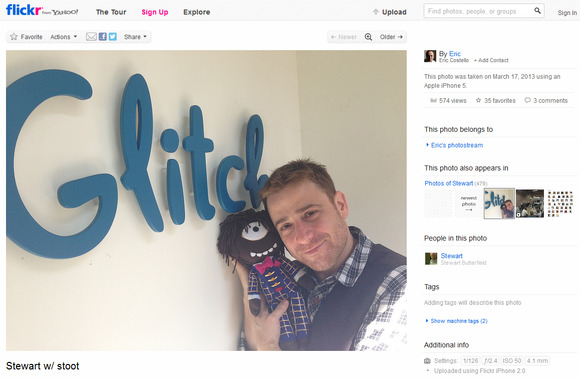 As founders of Flickr, Stewart Butterfield (pictured) and Eric Costello (who took the photo in this screenshot) have enviably short Flickr handles. Stewart's work on Glitch earned him this doll of his game avatar, made by Amber of SouthernGothica. Of course, Flickr wasn't really Butterfield's first effort. His first company, the Vancouver, British Columbia-based Ludicorp, was primarily focused on Game Neverending. But when Ludicorp shuttered GNE while it was still in prototype stage, the company used some of GNE's features to build Flickr. In 2005, Ludicorp was acquired by Yahoo—ironic considering Slack's tools for remote collaboration and Yahoo's new telecommuting policy. Butterfield left Yahoo in 2008, and in 2009 he founded Tiny Speck, along with Flickr's Principal Software Engineer Serguei Morouchov and former Ludicorp colleagues Eric Costello and Cal Henderson. When announcing Glitch's closure, Tiny Speck said its next project would be "unique messaging technology with applications outside of the gaming world." When Tiny Speck announced Glitch's closure last year, it made reference to a "unique messaging technology with applications outside of the gaming world" as the company's next project. Journalists speculated about what the project could be, but aside from a gentle correction on what the emphasis would be ("Not photo sharing!" Butterfield wrote), Tiny Speck has kept mum. Details on Slack are scant. Tiny Speck confirms that it will be software for SMB and enterprise, but hasn't explained whether the software will be Web-based or rely on a desktop client, or whether it will have a mobile component. "The collaboration market is very crowded," says Henry Dewing, Principal Analyst at Forrester Research. He points out that it includes competitors such as Microsoft and Cisco on the enterprise end and a bevy of smaller companies on the SMB end. But he agrees that there's room for improvement. "The big deal with collaboration for businesses is looking at how employees use tools, how they collaborate, how they make decisions," says Dewing. But collaboration platforms can also be hard to use, and companies often struggle to convince employees of the software's value. "Even once it's installed, they need to learn how to use it," says Dewing. "They need to understand how it can help them get their job done. That kind of adoption hurdle can keep them from getting the value of it." "More of a consumer mindset is a good thing. Somebody actually understands how individual users will adopt and use software." It's impossible to judge a product you haven't seen, but Dewing thinks that Butterfield's Flickr pedigree suggests a fresh perspective. "They'd come out with more of a consumer mindset, which is a good thing," he says. "Somebody actually understands how individual users will adopt and use software." Tiny Speck's website remains a static page, although on Wednesday it slyly introduced the word "working" into its mission statement, which now reads, "to make people's working lives simpler, more pleasant and more productive." Even the Glitch.com closing page that mentioned the "unique messaging technology" has been taken down and replaced with a Glitch image of a complaining piglet. This may not be a comment on the missing page. The Glitch piglets were terrible malcontents. 40. Ain't dead. Messed some things up pretty bad. Did others pretty well. Still plenty to learn. I think I'll get the hang of it eventually. Still, with the GNE-to-Flickr cycle as precedent, Slack's potential is intriguing. "I would expect it to have a very interesting brand," says IDC's Chute. "If I tried to dissect Flickr, how would I even map that back to photography? I would also expect a clean user interface, probably focused on an underserved market or market segment." Tiny Speck has Slack slated for release later in 2013. No specific date has been set, but the company says that development is on schedule.